In a plastic freezer bag, place scallops and ¼ c. marinade and lemon pepper, coat scallops well. Marinade in the refrigerator for at least 1 hour. Chop the green onions and parsley and reserve for topping the scallops. Cut off the ends of the asparagus (tough parts of the stem), rinse and pat dry. In a pre-heated sauté pan over medium-high, sauté the Asparagus in a tablespoon of olive oil with a splash of lemon juice and lemon pepper for about 5-6 minutes until cooked through. After scallops are done marinating, take them out of the bag and dry off with paper towels. Place them in the same sauté pan, adding remaining 1 tbsp. olive oil and a sprinkle of kosher salt and lemon pepper. Sear the scallops for approx. 1-2 minutes per side and addd the Marsala wine and cook for an additional 2-3 minutes. 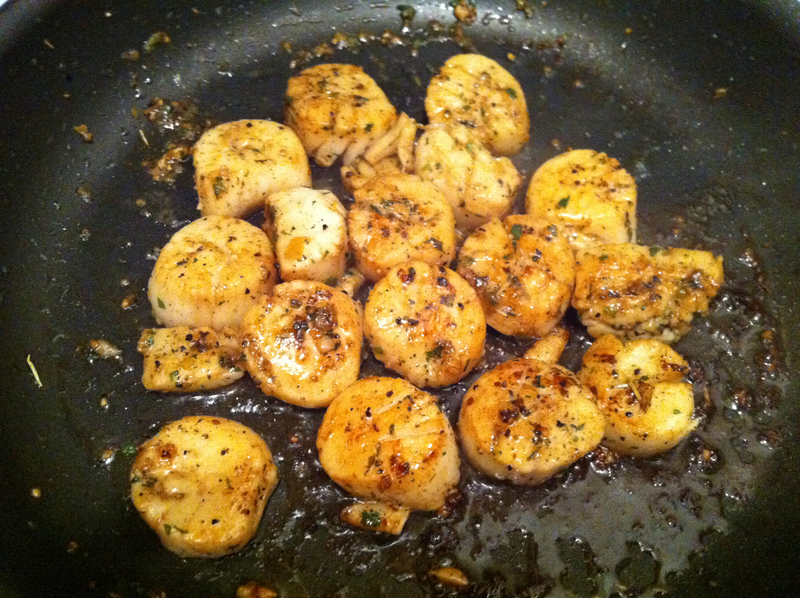 Sprinkle scallops with some fresh lemon juice and remove from pan. Place asparagus and scallops on a plate and garnish with chopped green onions, parsley and a lemon wedge.